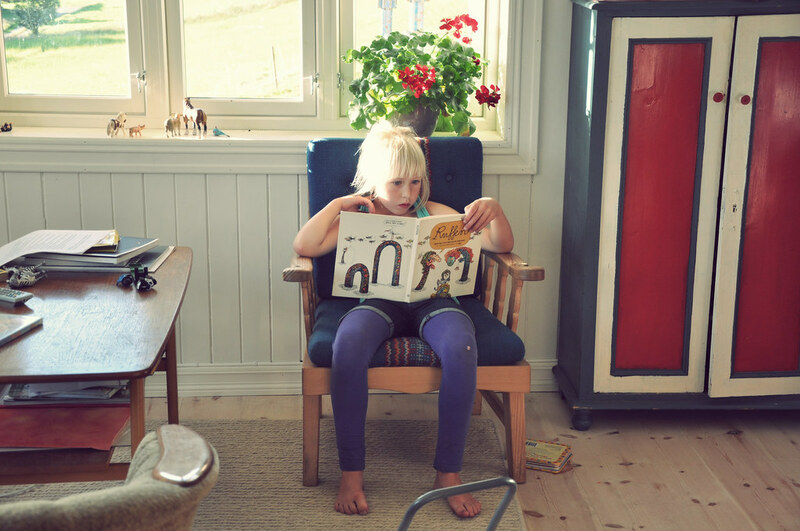 As a child, I loved sitting in a big chair we used to have by the bookshelf. My parents had lots of books, and I could spend hours sitting there, headphones on with one of my dad's albums playing (usually Bruce Springsteen or Dire Straits, or some obscure Norwegian singer/songwriter), looking through books, reading a few passages here, flipping through the photos there, suddenly becoming absorbed in something (usually something to do with the universe or the animal kingdom) and just losing myself there. It was entering a world of its own. I can still do it, get into that zone, and it makes my heart blossom when I see Ronja doing the same. Exploring, peacefully, feeding her inner world.